Hi all, getting my Golding Jobber #6 prepped to finally bring into my house! I’ve got a question about a chase base. My press came with 2 chases and I’d like to give one to a machinist friend who will be able to mill me a chase base that will fit right into my press, just like the chase does. When I bought my 6.5x10” Pilot the seller actually had one of these that she threw in which was awesome, I wouldn’t have been able to print what have on that machine without it. I don’t have any furniture or quoins, so I am looking to have one of these made for this press as I need to buy a base anyhow. Previously I believe I purchased KF152 plates from Boxcar to print on my Pilot and got pretty good results with the chase base I have for that press. Does anyone know exactly the height I need to tell my machinist to make my new chase base for the Jobber based on the KF152 plates? Would I be able to hand him my chase for my Jobber along with the chase base for the Pilot and tell him to use the same height of the Pilot chase base for the new Jobber chase base? I don’t believe there should be a height difference if I am still purchasing KF152 plates; type high is type high, but someone correct me if I am wrong? Would anyone suggest that I should use a different plate type? Also, another thing I noticed is when I uncrated my Jobber, the left gripper arm was bent. 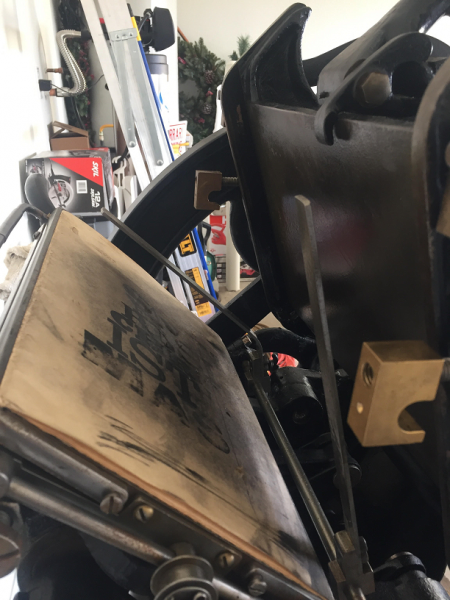 When I put the chase into the press and moved the platen one cycle, it bent it back slightly but it is still not straight like the one on the right side. Not sure how this happened but I am guessing I could just remove the gripper arm and have my machinist tap it back flat? Or do I really even need to do that? Yes, type high is type high. If it is type high. Do you know for certain that your Pilot chase base plus the KF152 is exactly type high? You say you got pretty good results with this on the Pilot. Why did you not get great results? It could be that the Pilot chase base was not meant for the KF152 plate. Give some second thoughts about a chase base for your Golding. With it you cannot use your grippers or conventional gauge pins. It will be less expensive to get a smaller base and buy some furniture and quoins. It may not be less expensive to get a smaller base and to buy furniture and quoins, the person milling the base for me will do everything at cost. He could make me a regular base too, but I am just trying to figure out exactly how high I should make my base for the KF152 plates, or if anyone thinks I should try a different plate type which would change my base height. Also, even if I wanted to purchase a base from boxcar anything I would need is out of stock. I’m utilizing other options. And I was happy with the results on my pilot, but it needs a repair on one of the roller arms so that is why I did not get “great” results. I made it work while I had to use it, but when I move it out west (it’s on the east cost right now) I only plan to use it for blind impression until I decide to get the roller arm fixed. As of right now it is unable to properly ink. As far as impression the chase base did a good job. You will have the problem Inky pointed out, though, of having a base that is the full size of the chase, so that you will not be able to set gauge pins anywhere on the platen (except maybe, as I have done, pieces of spacing jammed into the lower bale), though you could use the Henry compressible gauge “pins” which are adhered to the platen covering. Is that how you positioned the paper on the Pilot? But I don’t know how they would stand up to being repeatedly smashed. 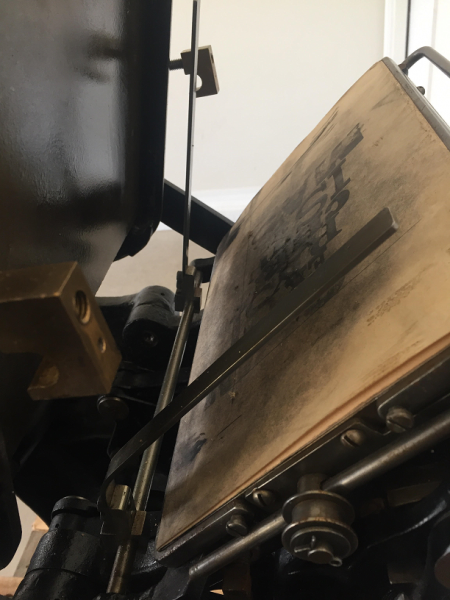 There is another solution of sorts — you could decide to make the printing area of the platen smaller with a margin below and to the left for the gauge pins and position your plates so that you always feed to the pins in the same place, and the impression area is packed extra thick, with the platen adjustment backed off to compensate. Bit of a kludge though. Well, I am also looking for the quickest way to get me up and running and I wouldn’t know where to look for a base if boxcar is out of stock. I’m pretty sure the machinist can make me something faster. I’m sure since it’s custom I can figure out how to make room for gauge pins. I was just trying to figure out my height for the base. I can even ask him to make the actual surface area of the base smaller to allow for gauge pins. I believe the dimensions for a base for an 8x12 chase isn’t even 8x12. so I think we can work around that. I was really just wondering if anyone had the exact height I need to give to my machinist to make something for me. I saw a blog post on this, but it wasn’t completely clear and left me with some questions so I thought I would post here. Also does anyone have any suggestions for my bent gripper bar? I do want it straight, and I am thinking it can just be tapped flat again but I wanted to make sure before anyone said I needed to find a new one. Thanks. Gripper bar is easy. Just beat it out flat. Do remember that you cannot use it anywhere it will be struck by the base. Take a piece of your KF152 poly to your machinist. Have him measure the thickness with his micrometer. Tell him that the thickness of the new base is to be .918” minus the thickness of the KF152. Thus the total is type high. The gripper bars- as mentioned- are really important to note here. Are they THINNER than your plate material? Add .004 for adhesive backing. .854” base height for a machine set to work with type high. So the question is- are your gripper arms THINNER than .064”? Because if not, whatever packing you add to your press plus wherever they overlap your paper will cause them to strike the base, and likely cause a dent in your paper. If not overlapping your paper, but using the like- rubber band or string methods…. Your grippers will have to be thinner than .064”+your impression depth. Meaning whatever packing you added behind your paper to vary the impression depth will have to leave a space for the gripper to exist in between the base and the top sheet of packing. So, even if you use compressible gauge pins or something, this is why it might not be the best idea to fill the chase on some floor model presses- I know that my C&P has very, very thick grippers that cannot exist between a deep relief base and the topsheet; I have to print with the grippers set pretty wide, outside the base, or they can be smashed, dent the base, seize the press up potentially, all that stuff….. If your machinist is local and willing to visit your press, you might have them micrometer your gripper fingers (or you can measure them with a caliper/digital caliper, if you have one), for the peace of mind. you need quoins and furniture? you need to get a hold of me. i have tons of either. I think if I were getting a custom base for my press I would just run the grippers to the edge of the platen (making sure they don’t interfere with the roller supports) and measure the horizontal distance between them at that point. Add about 1/4” to that measure and have the base milled low enough at the edges to accommodate the grippers. That way, you could lock the grippers in that position and use gripper fingers or rubber bands to draw the sheet away from the form if necessary. As AdLib suggests, you could use the Henry Compressible guides to put the paper anywhere on the platen. They are designed to be repeatedly compressed with no degradation. I specifically developed these after watching a video on YouTube of someone feeding business cards to the lower left corner of a 10x15 platen, risking too much of their fingers and hands with each impression just to avoid crushing their base or the pins. Hi all, thank you for the help. Yes, my machinist is local and he may be coming to the house for another reason this weekend so I can ask him all my questions then. Attached are a couple pictures of my grippers, and the left one showing the bent issue. I don’t know that it is as bent now because I did put the chase in the press and moved the platen one cycle which did bend it back a little, but not to be completely flat. I get what you mean about them being smashed if I fill in the chase. I will have my chase base for the Pilot in my hands today so I will see if we can measure that, but Haven Press’ answer of .854” was probably what I was looking for. I can have him mill me anything based off of that, whether it is a regular base or a chase base while keeping my grippers in mind. I will probably be using the rubberband/string method as that is how I remember printing before. It’s been a while but I am getting back into it! Thanks all for your help, and ericm, I may be contacting you for furniture and quoins if I end up with a regular base. One more thing, the press had a tag on it saying that unpainted surfaces were treated with rust inhibitor and that it should be removed with solvent before operating. Can anyone give me some specific areas that I may need to apply solvent? It’s just kind of hard to tell. Thanks! From your photos, the gripper should be easily bent back without breaking, it appears it was quite malleable material, and should readily be returned to its former glory. The roller saddle is quite another concern, however, as it bears little resemblance to the standard Golding “lyre” roller saddle which holds three rollers. It appears that there is a single roller saddle attached. Is there but one roller? There’s 2 roller hooks attached, and when I opened up the set of 4 rollers the seller sent me, there appears to be another set that can be attached. I know it looks nothing like the original and I haven’t seen any that look like this, but the seller did not even mention these ever being an issue. It wasn’t something I noticed as being out of place in the photos (I was not very familiar with this type of press and wasn’t totally sure what to look for) but the seller was a very nice man who was willing to label everything for me (bolts and such) for when the press is to be reassembled. It was brought to my attention only when I uncrated it, and I am hoping they won’t be an issue. Hi everyone, so my machinist stopped by yesterday and took a chase with him and my bent gripper arm. He’s going to measure the gripper arm for me and I am going to send him the dimensions that I need the deep relief area of the base to be, I think this is 6x9 for an 8x12 chase? Just want to be sure before I give him that dimension. Also, upon researching some things, I found the following on Boxcar’s site: “All our Deep Relief bases are inspected to be within .001” of the .853” thickness (flatter than some type beds). With the addition of the KF152 plate plus the adhesive backing, you’ll reach .918” type high.” So, does the height have to be .854” (which is what Haven Press said) or does it need to be .853” which is what Boxcar said? Just trying to figure out exactly what I need to tell my machinist in order to achieve type high with KF152 plates. On the basis that type height is .918” and you subtract the base height of.853”, it leaves you with .065”. A KF152 plate is .05984” thick, lets say .060” in round figures, you are left with 0.005” for the double sided mounting tape so if you are within one or two thousanths of an inch you are doing pretty well.